It's the holiday season! As a musician, that mean the holiday song requests will be coming in. I have a couple gigs comingup next month and thought I'd make some Christmasy attire. My favorite song is Christmas Waltz (I even covered it HERE!) and I thought it would be cool to stamp the song lyrics on a dress. So here we go, this is how I made it! Cotton dress - the smoother the fabric the easier it will be to stamp on. Embellishments like pom pom fringe, a brooch, etc. 1. Set your dress out on a flat surface. If it is a brand new dress,make sure to wash and iron it. Spread out the dress if it is flared, and use the chalk to draw light guidelines so you'll know where to stamp your letters and keep them even. 2. Set out your letter stamps on a table. I found it was easiest to sort them by upper and lower case in alpha order. 3. Get stamping! Press the stamp onto the ink pad, make sure it is super juicy and then firmly press onto fabric. I like that the stamps have a little handle, that way they press evenly. 4. Once all the lyrics are stamped, you'll want to embellish! 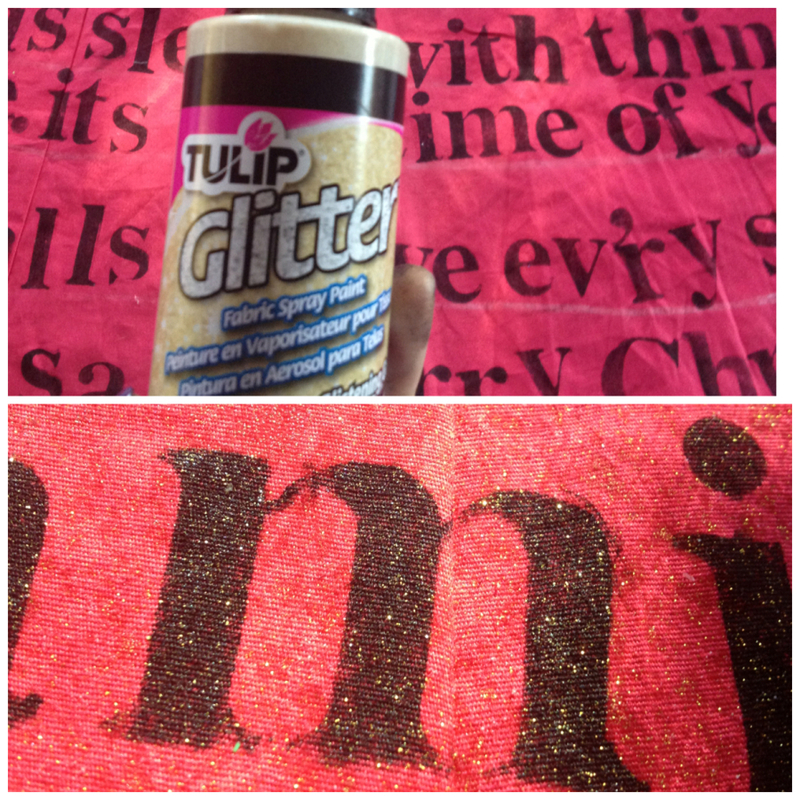 I covered my dress in Tulip Gold Glitter Spray, it's a fine mist so it doesn't look overpowering, which I like. 5. 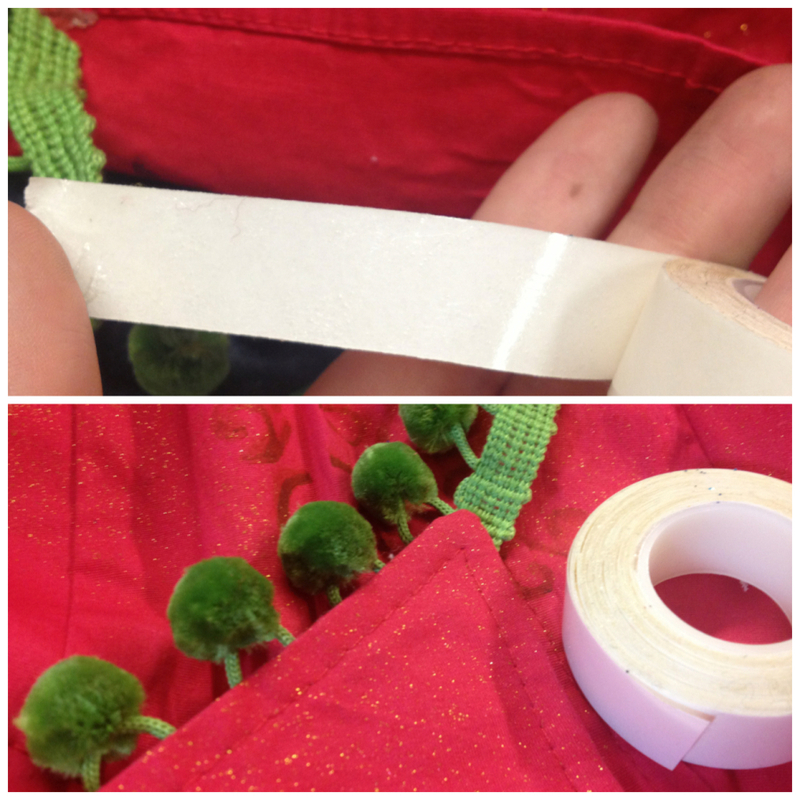 Because I want my dress to be noticed from the stage, I thought I'd add some green accents with pompom fringe. I used Aleene's Fabric Fusion double sided tape to add it. I didn't want to sew and I like that the tape is permanent bonding! 6. Lastly, I added Tulip Glam It up Crystals on the collar and added a feather brooch. I'm ready for the show! This is so delightful, Missy-moo! Wow! And I love how near the hem it says Merry Christmas and Happy New Year. You look adorable in your glam Waltz Dress!